December | 2011 | Extollagy! I’ve spent many hours staring at North Korea. Only earlier this year, I was dumbstruck once again to be in a neon-split Chinese city of traffic and business which looks out across the north Korean border to its partner city, where not a single light burns at night except the spotlight onthe statue of the Great Leader: https://joncannon.wordpress.com/tag/north-korea/. I’ve even been there — http://www.lrb.co.uk/v22/n15/jon-cannon/diary — and it was the only country I’ve ever been to (and they included such feared and stereotyped nations as Iran, and indeed China itself) that didn’t prove to be quite different from its reputation when actually visited. But then, one doesn’t actually visit it: every moment is packaged, and moments of genuine human interaction are rare. One experiences a Stalinist/Cold War theme park, rather than a real country. It’s hard to overstate this: I seriously wonder if any population in human history has been controlled and cut off to such an extent and for so long. The challenge, if it comes, will surely not come from any western (or even South Korean) idea of ‘democracy’ but from the portion of the North Korean ruling class who have visited (or who see from their bedroom windows) China. One can ignore or doublethink many things, but the living proof that one’s only ally in a post-Communist world is growing and one is not will be obvious to all. Whether NK can make this change is another question entirely. In Kent there is a Cambry, and in Cambry there is a crypt, a crypt I know to have been built under Archbishop Anselm and his prior from 1099, and which Russell Hoban knew to be a dark heart of beauty and strangeness with enough power as a building to form the terrifying centre of a post-apocalyptic work of fiction. No other work than the resulting Riddley Walker gets closer to the emotional heart of the complex, subjective, powerful, …. spiritual dimensions of the buildings and places my work and life are so deeply committed to. Goodbye then, Russell Hoban, and my Eustach be with you. A desire to understand one extraordinary, indeed flabberghasting, medieval building – – the east end of St Augustine’s abbey, Bristol, now Bristol Cathedral — has been the fuel of not a little obsessive activity chez this author’s brain over the last decade or three. And among St Augustine’s many remarkable features is the way in which its design is infused with the interests of one particular medieval family — the Lords Berkeley — as they stood in the early fourteenth century. One line of enquiry, then, has spun out from it into an investigation of the lives and interests of the individual members of the Berkeley family who held the lordship at this time. Some of the fruits of this will be published next week — http://www.boydellandbrewer.com/store/viewitem.asp?idproduct=13759 — but the investigation has spun on, for the research in itself has brought to life the complex network of friends, relations and rivals these individuals inhabited — and amazingly, several of these people (most of whom were local knights and gentry rather further down the pecking order than the Berkeleys themselves) — have also left physical and documentary tastes of their lives and interests (especially pious) behind. These traces are battered and fragmentary, but they still suggest the potential to piece together something of a small group of human beings, men and women of fourteenth-century Gloucestershire, and some of the artworks they funded. And that’s the reason for a visit to Winterbourne, a village in choppy pre-Cotswold hills, swollen and cut off from its church by proximity to Bristol, and its very helpful and active parishioners who afford me access to St Michael’s church in spite of it being one of the least convenient days in the entire year so to do. My quarry? 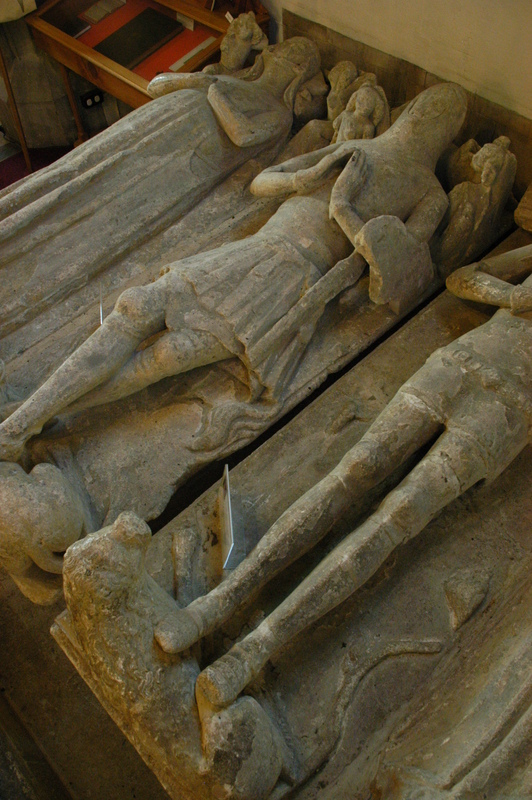 A series of fourteenth-century effigies, one of whom is almost certainly Thomas (de) Bradestone (or Bradston or Breadstone, depending on the source). He’s a key link historically for his closeness to Thomas III Lord Berkeley, by far the most interesting of the men who was lord while St Augustine’s east end was being built. Thomas acquired the lordship after his father died imprisoned at the hands of Edward II; within a year, the benighted king was in turn dead, in Thomas’s own castle.. He seems to have spent much of the next decade succesfully rebuilding his and his family’s reputation, including a remarkable series of commemorative foundations, some to his wife and others to other members of his inner circle, around his estates in the 1330s and 40s. The buildings I’m interested in all date from this period too: and Thomas Bradeston is relevant to them. His arms are visible in the east window of Gloucester cathedral, funded in the wake of the cult of the murdered king, as well as Thomas III Lord Berkeley’s east window at St Augustine’s. St Michael’s church is alone in a field, almost on top of the M4, with nothing around but the lowering medival barn and a manor house that seems to have been half converted into a Wimpy home in the 1970s. Its safe to see the occupiers of the manor as dominant figures in the life of the church that is virtually in its back garden. Its an impressive building because of its spire, which, excitingly (for me at least) reveals up-to-the-minute late Dec/early Perp detailing of the 1330s or 40s or early 50s: much as I’ve come to expect in buildings associated with these people at this time. The spire was a striking addition into what, in spite of the Victorianisation of the east end, the west end and most of the windows (! ), appears at that point to have been a handsome structure of around 1170-90, with the very tasteful early gothic detailing of many Bristol-area churches: most obvious now in the chancel arch, cut back for what must have been a low and early chancel screen, as well as the the priest’s door, fragmentary corbel table and redone windows of the chancel itself, and the delightful south door, with shafts of polished stone and a semiricular arch made up of enormous and again very early great loping cusps. And here inside are the tombs, giant figures making a stone dormitory of an entire corner of the north aise. battered remnants of my past lives. Firstly, as is always the case with such objects, we have to drop any idea that they are portraits. These are ideal images of knightliness and ladiness-ness, imagined chivalrous and whole, as they hoped to be (prayers encouraged) at the moment of future and imminent resurrection. Secondly, we have to assume violent, context-demolishing, memory-and-intention eradicating change between their creation and their current state. Their patrons would be shocked to see them forced in this way, bare of colour and battered of detail. Which doesn’t make them unimpressive. Indeed lying here in a row, fixed on their great stone platform, they seem to be waiting for Something, Anything, even a horseman or four, bursting off the Hard Shoulder and across the fields. Two knights, two ladies – two couples, seperated (judging by their armour) by a couple of decades. The later one looks 1360s; the earlier, and more interesting, 1340s. He is enormous, far more than lifesize, unless this was a race of giants; most effigies are slightly smaller than they would really have been in life. And he lies with a distended, almost painful courtly stiffness which must be cramp-agonising after 600 years in that position. Indeed his legs are stick-then, far too pin-like to be any good for fighting on, and as well as being crossed they skew off at one angle as if caught in the middle of a dance. His (I presume) wife) lies next to him, wearing a long smooth dress that falls smoothly and then clumps in elegant folds at her feet. He is standing on a rumbunctious lion (they usually are), she on two toy dogs (more unusual). Indeed both the toy dogs and the handling of the drapery are very close in idea to the tomb of Margaret Mortimer (d.1327) commissioned by Thomas III for St Augustine’s. But they’re not by the same hand: this slightly giantesque, distended, very stylised detailing is closer to the workshop that produced the extraordinary Ashbury Giants in Berkshire and other works in Oxfordshire (and perhaps more tombs of the Berkeley familia at Leckhampton and Cobberley?). But it is good stuff, in with the latest ideas; yet if current indications are anything to go on — and they are not much — the tomb chests on which both pairs of effigies lay were very plain indeed. The other pair are similar in scale but less unusual: effigies, like architecture and art, sobered up and straightened out generally between the Black Death and the Peasant’s Revolt. They call it Perpendicular. And I realise I need to get my Bradeston’s straightened out, as it’s this latter pair that are the monuments to the Thomas commemorated in glass in Gloucester and Bristol (indeed he’s even been fingered as the patron as the latter work). But that’s ok: we can just as easily see him as patron of his father’s effigy, albeit in line with his wishes, just as the second tomb is equally likely either to be posthumouss or created some years before his actual death. Which is why the rest of the church is so interesting. Firstly, there are two more effigies: at the feet of the four giants is a smaller lordly female of around the same period, presumably a wife (or perhaps a daughter) who pre-deceased those shown here: just the same thing happened to Thomas III, leading to some replanning of his own burial arrangements, I have argued. And at the east end of the north aisle is the only tomb with a surviving architectural setting, another very good 1320-1340 effigy in a shining smooth stone, a bizarrely stretched and smoothly detailed figure whose lion has a magnificent, spreading tail. Effigy trainspotters must enjoy the spur on his left leg, sketched out but apparently left uncarved. He lies beneath a big cusped, low (and early) four-centered arch which shoulders outwards at the base out in a jokey fashion typical of the era, as if the effigy that arrived didn’t fit; it retains significant amounts of colour. Recent work has attibuted this to a member of the holders of another local manor, the de la Riviers, another family (now less significant to the Berkeleys’ inner circle) are remembered in stained glass at Bristol. So six monumental effigies, all created within a 20-40 years in each other, and between them meaning this small church had as many or more monumentalised burials as some cathedrals. Remarkable. There was presumably an altar by the ‘da la Riviere’ tomb; certainly beyond it there is a small chapel. This, sadly, retains little detail — except for two C15 statue brackets bearing Bradeston arms, and a C14 window with simple but reasonably modish fishtail tracery. It’s a big chapel and apparently at one point all four double images were posiitioned in it. Family chantry? Possibly, but there’s another contender. The tower, on the north side facing the manor, is by far the building’s most elaborate structure. Ogee-headed statue niches, curvilinear parapets, a tall spire at the base of which are stylish ogee openings without mouldings. And its base, which is thus a kind of dimuntive north ‘transept’, was also a chapel: a piscina, a squint, a rare early Perp/late Dec window (1350s?). This is unusual, and even more so is the decorative scheme which, remarkably, survives, battered and fragmentary though such things are. 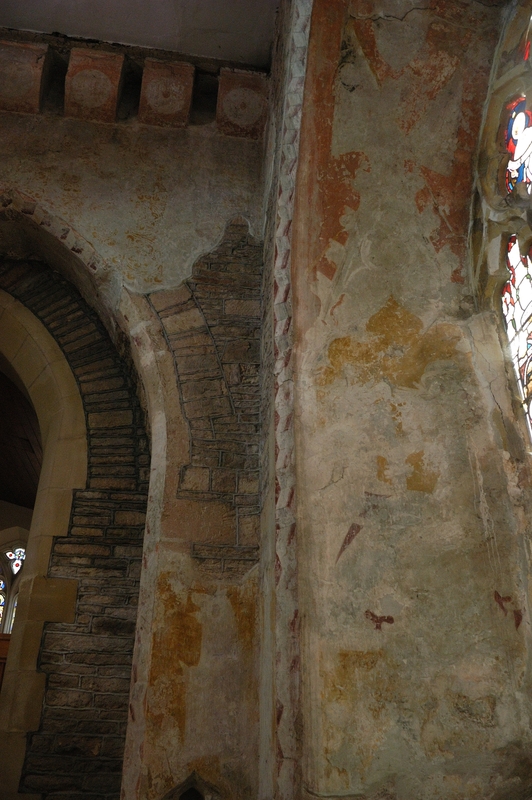 This space, by the way, must be a rebuild, forentrance is afforded by an arch carried on big, early C13 bell capitals. The painting is very striking indeed. The splays of the Dec/Perp transition window are filled with enormous, swashbuckling ogee arches and finials, painted (if current appearance is a guide) very freely and boldly. The arches themselves have a 3D zigzag on them, the kind of thing one expects more in the C12: at Kempley at that date the zigzag is visible both carved and painted. One thinks of the reuse of C12 carved zigzag at the revolutionary Gloucester south transept of 1331/2. And almost all the iconography is, and almost was, aggressively secular, knightly: colossal heraldic achivements and banners rise behind the splay-ogees; roses fill the collossal corbels for the ringing-chamber, a knight, presumably Thomas himself, sits praying towards what was the east window before the C19 created an aisle to the east. Religious imagery, of course, originally in the window itself and all over the altar; but on the walls, its squeezed only into smallish figures high up: a St Michael has been identified (it says here) and a Three Living and the Three Dead, both knightly-commemorative themes. All in all, the extent to which this sacred space in a church is a dashing and noisy celebration of knightly lineage is really quite remarkable — and there are thus many overtones of St Augustine’s, albeit with less high-artistry. In Bristol for example the knightly interests have been able to inform the structure itself: an even bolder and far more expensive thing to do. And there’s the Berkeley chapel, also opening off one side of the church, also incorporating-while-demolishing a preceding structure of some kind, and once very richly decorated. One specific parallel: SS Dismas and Gestas were depicted in the splays of one east-facing window at the Berkeley chapel, suggesting interesting and innovative co-ordination between iconographies in glass and paint. Could something similiar have taken place here with the kneeling figure of Thomas? The Winterbourne effigies are lucky enough to have benefited from detailed recent study by Sally Badham, one of the main experts on medieval effigies in England, and I’m writing this without have read her article — but it seems to me there are two spaces in the church associated with Bradestones, and the tower chapel must rank alongside the chancel chapel in significance. Could one pair of effigies have been in one building, and the other in the other? 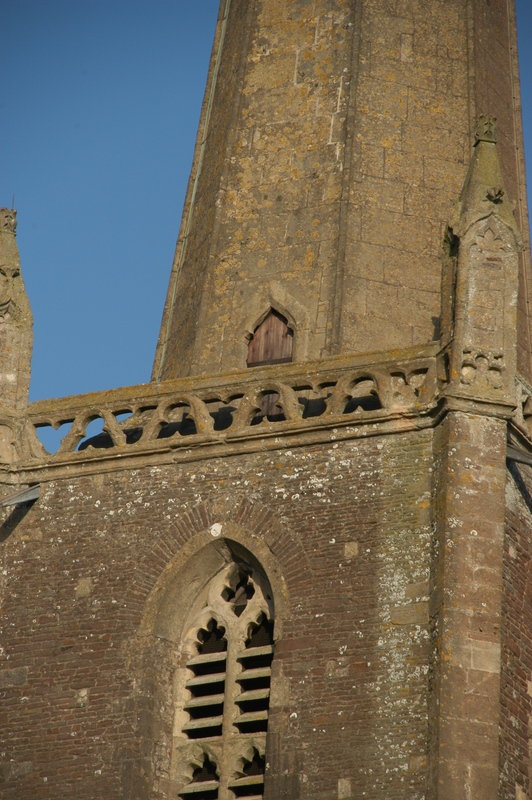 The date of the chancel chapel is unclear, but the tower chapel lines up firmly in the 1330s-50s, and in 1351-2 Thomas founded a chantry ‘at the altar of St Michael in the church of St Mary, Winterbourne’, reversing the current polarity of dedications at the church. Now altars to St Michael in towers played a significant role in funerary rites in the eleventh century: could something like this have been the case when this church was built, a hundred years earlier, and retained, if privatised on the interests of one family, when the space was being rebuilt in the decades under discussion, topped off by a statement tower which would have been very visible to people making their way from Bristol into Gloucestershire? 1351-2 is an excellent completed-bydate for the tower. There cannot be any doubt, given its lavish decoration, that this was an important chapel and a major, perhaps *the* major, focus of the church interior. Could one of our double Thomas’s have dominated this space, leaving barely room for a priest and a deacon or two? More fuel for my patronal-artistic fire.